Over 100 years ago game keepers required a dog with the loyalty, strength and guarding capability of the Mastiff but greater speed and agility so the Bullmastiff was developed from the Mastiff. Today Bullmastiffs are a separate breed. Overall the Mastiff is larger, heavier and longer in body than the Bullmastiff. When considering a dog, please realise that you are taking it on for its lifetime. Like many large breeds of dog, the Mastif has an Average lifespan of 8-ten years. The Mastiff is a giant breed of dog. One example of the breed is listed in the Guinness Book of Records as the heaviest dog in the world. Males are generally larger than females. A full grown adult Mastiff will generally weigh between 60 and 100 kgs and in height, their head will be at approximately the waist of an average person. 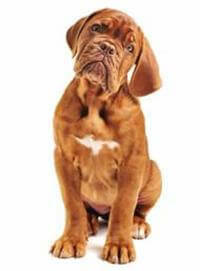 The general running costs of a Mastiff are much higher than smaller breeds. This is a big consideration e.g. a course of antibiotics for a small dog may be $25, for a Mastiff $100.